With the proliferation of “plastic” playing surfaces in Scandinavia, Scotland and some tiers of English non-league football, it has become clear that plastic pitches will become the future for many sports clubs in the future. Harking back to the 1980’s when the likes of QPR, Luton, Oldham and Preston installed synthetic “astroturf” pitches that saw regulation footballs bounce with such unpredictability they were and remain outlawed from levels 1 to 6 of the English game. That equates to no club from the Premier League to Conference North/South being permitted to lay a synthetic surface. Many clubs outside of these levels have installed pitches with few complaints and a huge increase in club revenue. Clubs such a Maidstone United, Sutton Coldfield Town, Loughborough University and Stockport Sports report their artificial surfaces being in use seven days a week. For example Sutton Coldfield’s Central Ground is now hosting games for three other clubs on a full time basis namely Romulus, Grovenor Park and Aston Villa Ladies as well as sundry other use by local teams. Currently in the Scottish League Montrose, Stenhousemuir, Alloa, Airdrie, Annan and Forfar have already laid artificial surfaces. However, they remain banned in the Scottish Premier League, in 2008 Hamilton Academical had to revert to a grass service upon promotion to the top flight. In Scandinavia many clubs have used synthetic pitches successfully for several years. In central Europe Dutch club Heracles Almelo and Austrians Red Bull Salzburg have gained widespread praise for their artificial surfaces. A 3G surface can cost upwards of £400,000 to install but maintenance is minimal and many clubs report their installations are a resounding success. The positives are the generation of a year round revenue stream and forging closer links with the community. Instead of a pitch being used by a handful of players once a fortnight, a thousand people a week can use a 3G surface with no deterioration for the host club. Statistics reveal serious injuries are less likely on an artificial surface than a traditional grass surface. So what is the difference between 3G, 4G and 5G artificial pitches? Some cynics would say the terms are nothing more than a marketing strategy for companies to persuade interested parties in parting with more money for the very latest in pitch technology. Essentially 3G pitches come with sand and rubber particle carpets which simulate to high degree the bounce of a natural turf surface. The pile height varies depending on the type of activity it is being installed for. The differences between 3G, 4G and 5G pitches are subtle. 3G pitches have the sand and rubber compound particles, 4G have no particles but a rubber shock pad underlay. 5G pitches have fully rubber particles to provide the correct bounce the artificial surface needs. There is already research and development underway by manufacturers in the sixth generation of surface. Whatever the outcome current analysis proves that synthetic surfaces have a very bright future, climatic and economic factors will inevitably dictate a wider audience for this product. There are literally hundreds of eye poppingly beautiful non-league grounds in England, here are just twenty good ones with some background and pictures. Before any arguments ensue they are ranked in no particular order! 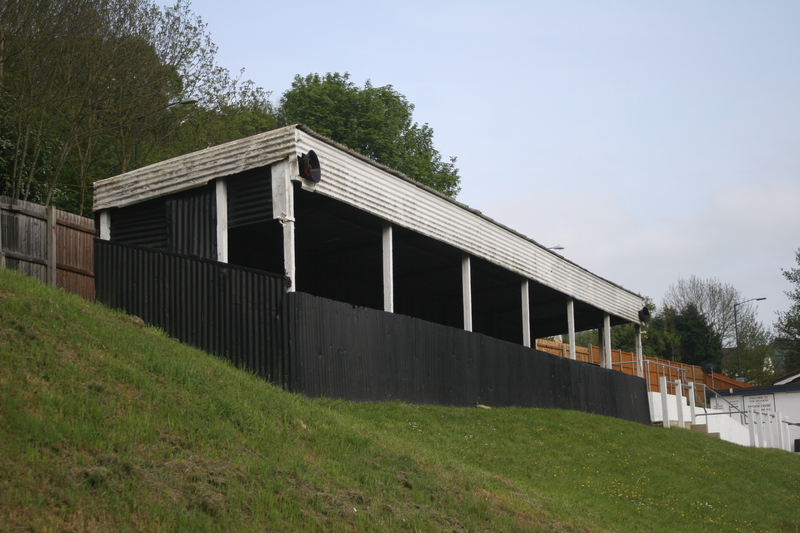 Bexhill United have only ever played at The Polegrove since their formation in 1926. 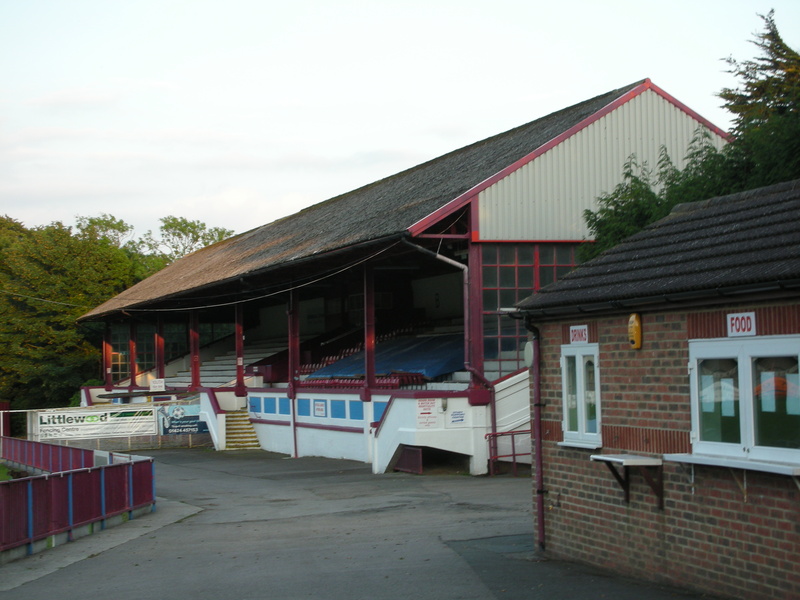 The superb mock Tudor brick and timber built grandstand was opened in 1929. The spectacular stand houses the teams changing rooms and a smaller officials room. 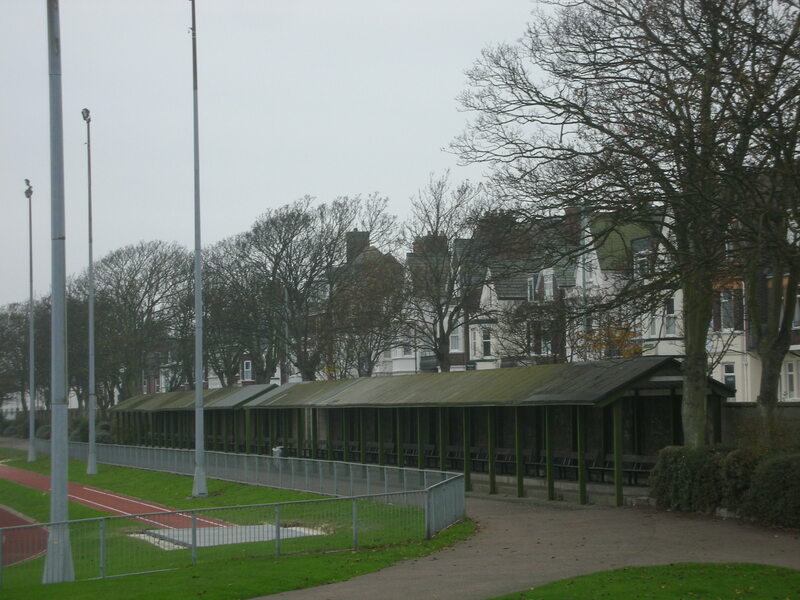 Adjacent to the stand on the seafront side of the ground is the clubhouse which was completed in 1987. 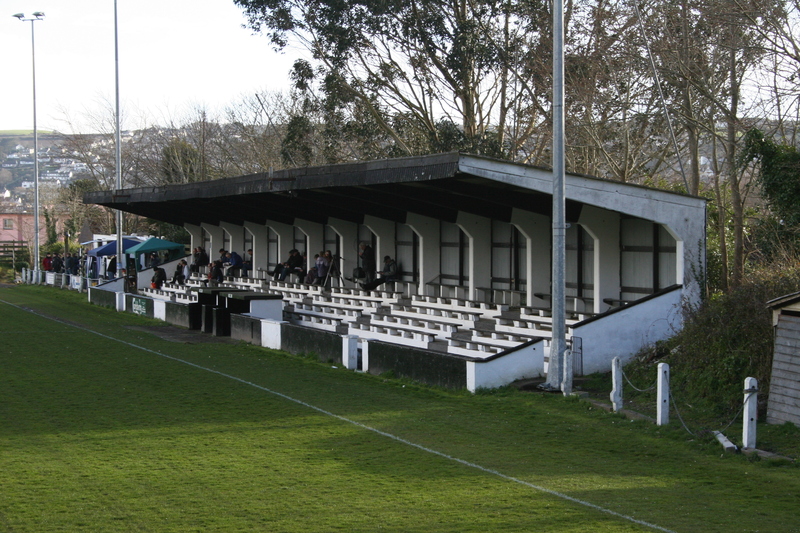 The club has spent recent years in the lower reaches of the Sussex County League, but are rightly proud of their grandstand, one of the most attractive in the country. 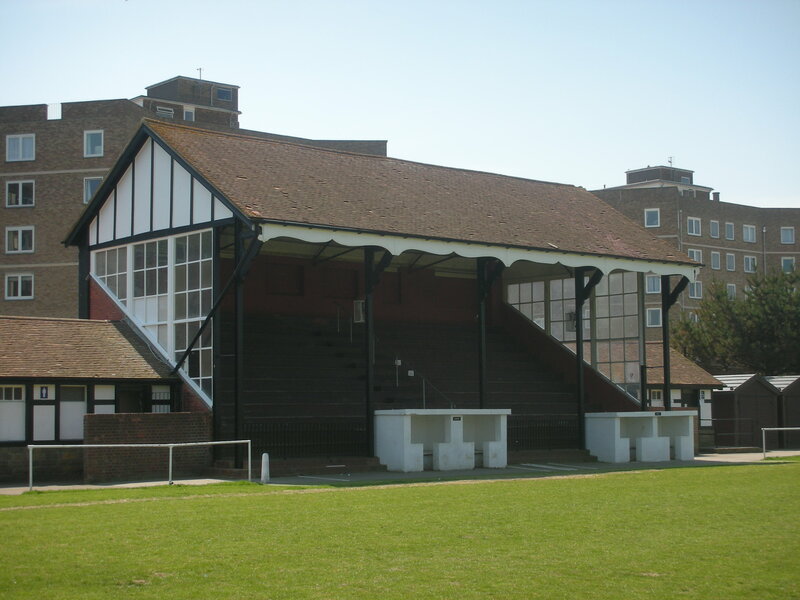 In the summer of 2002 the old Bexhill Town club merged with Bexhill Amateur Athletic Club to be renamed as Bexhill United. As you arrive in Bodmin on the A389 the huge site that is Priory Park lies in the shallow valley to the left and its photogenic stand looks great from the roadside. Adjacent to the ground is Athelston House and behind it the valley banks up sharply and the superb vista is completed by the distant focal point of Gilbert’s Monument. 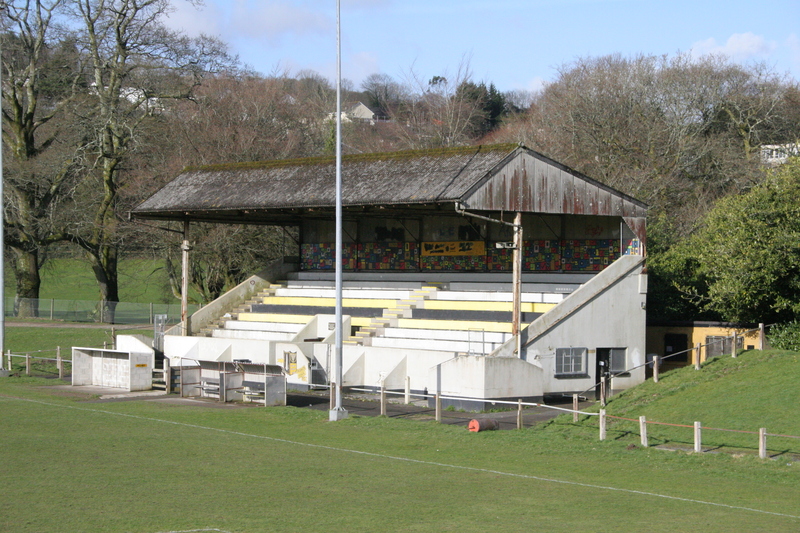 The stunning pitched roof stand was opened in September 1958 some ten years after the club started leasing the site from Bodmin Council. 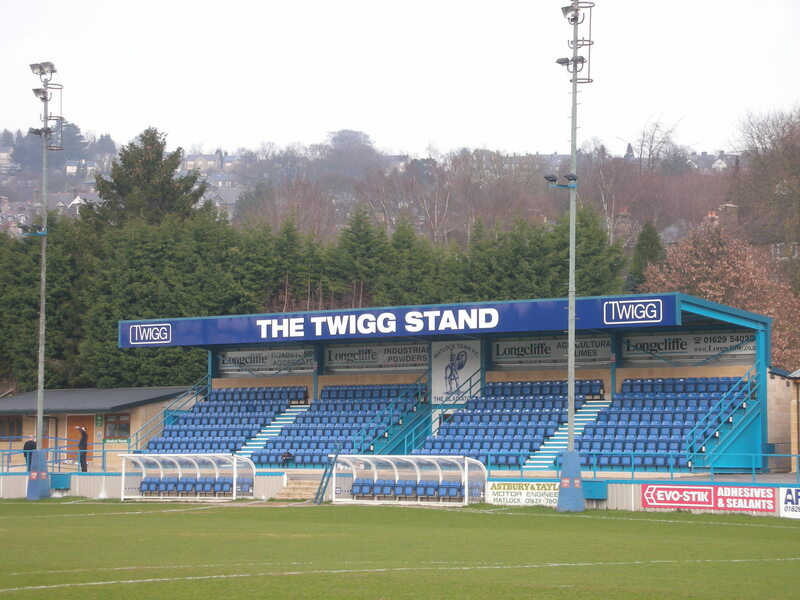 At the time the stand cost some £2,500 to construct but was worth every penny as it remains one of the best in the area. However, the club have lofty aspirations and either a move or substantial redevelopment remains a possibility. For stadium purists these plans are sacrilegious. One of the many picture postcard grounds that grace the Gloucestershire countryside. Opened in 1946, The Meadow was levelled off to form a useable playing surface and much of the earth was compacted to form a sizeable bank on the London Road side of the ground. A wooden cover was erected into a cutting in the bank and although appearing somewhat precarious, provides a marvellous view of the match. The pitch is set off by a smart white post and rail fence. Looking past the stand and bank, the overall picture is complete by extensive woodland rising sharply in the distance. 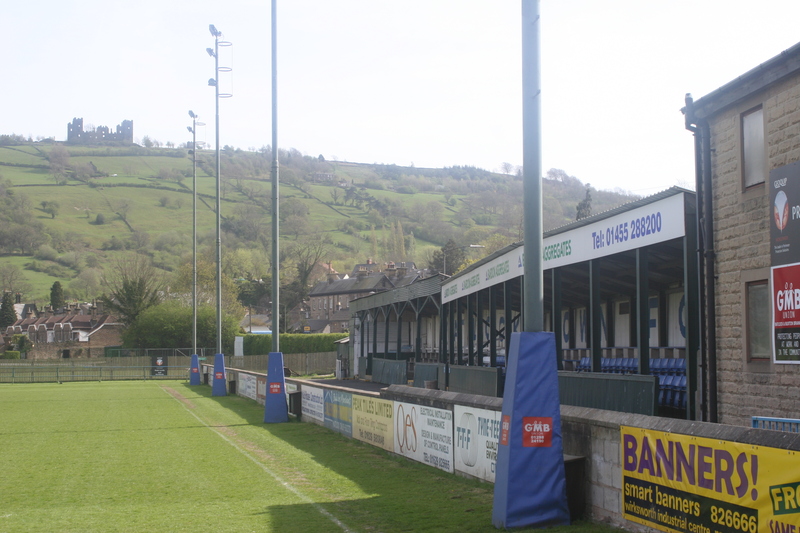 Brimscombe and Thrupp, a modest club with a pretty little home. 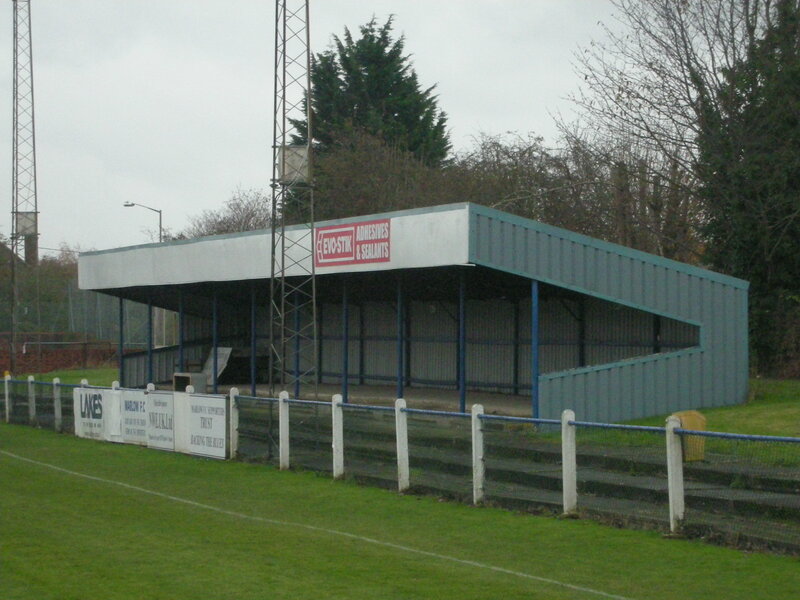 Update: This picturesque stand was replaced during the summer of 2013 by a modern kit build stand at the request of the Hellenic League. Buxton is an ancient spa town in the beautiful area of the Peak District and is one of the highest towns above sea level. Buxton claim to have the most elevated ground in the country, although the good folk of Tow Law Town came very close on a battle of the altimeters. The club played their first match at Silverlands in November 1884, when it was little more than an unenclosed field. The first covered accommodation was erected in 1890, primarily “to encourage lady supporters to the ground”. Soon after a grandstand was opened and stood until it was replaced by the present main stand in 1965. 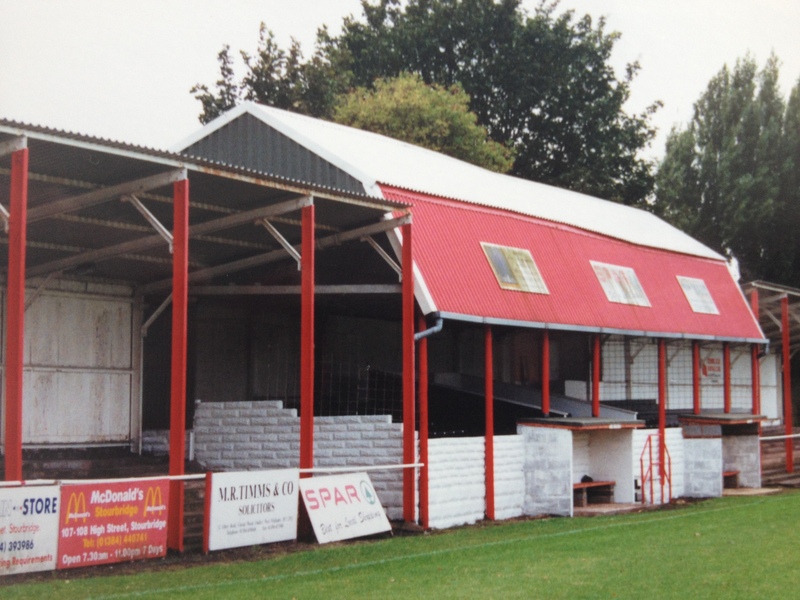 In 1980 the dressing rooms were replaced with new facilities under the main stand. The club invested in a new drainage system in 1979 and the move has paid dividends, with waterlogging in this area of copious precipitation being a rare occurence. 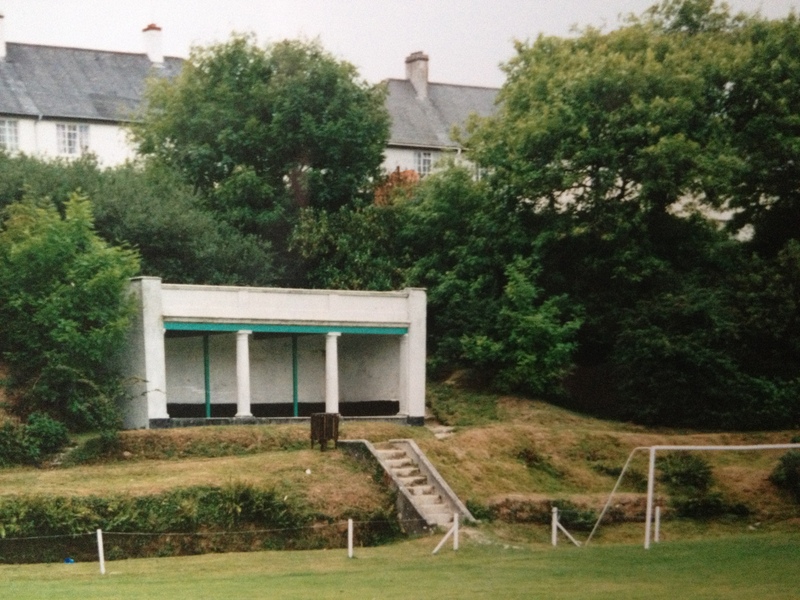 In the early 1990’s the terracing was re-laid and the old covers replaced. 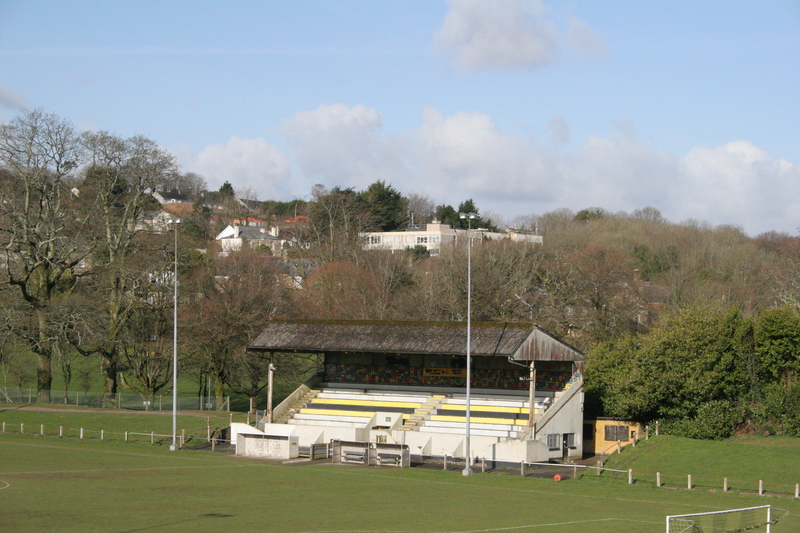 A visit to this ancient sports ground and delightful town is a must for any stadium buff. Victory Park is a quite magnificent venue, its main stand, built in 1947, is a national treasure. The roof is supported by an impossible amount of criss-crossing metalwork. Following the discovery of asbestos recently the ancient roof has been sympathetically replaced with more modern material. Both ends at Victory Park have large covered terraces, the car park end, the elder of the two, is another design classic with a myriad of roof supports. The ground, however, has had its share of disasters with the original Pilling Lane end being blown down in a gale in 1929 and the first grandstand being reduced to a pile of smouldering ash in 1945. The side opposite the main stand has substantial grass banking and has never seen any real development. The club’s catering hut even sells the local delicacy of butter pies! Victory Park has survived the push for modernity intact and is a welcome reminder of how grounds used to look. A truly classic venue. A very famous club from the old amateur days, being five times winners of the F.A. Amateur Cup. The club is renowned throughout Europe and even played the mighty Barcelona no less than ten times between 1913 and 1922, losing only four times. So close were their ties with the Catalan club that they even borrowed Barca’s famous goalkeeper, Ricardo Zamora for one game. Crook also went on tour to Norway in 1963 and, famously, to India in 1976 when crowds in excess of 100,000 flocked to see the side from the Northern League. In 1898 the club left their Welfare Ground at Bankfoot having purchased a new site in West Road for the princely sum of £625. The ground at Millfield expanded rapidly and the original grandstand was replaced by the current 500 seater in 1925 at a cost of £1,300. The rest of the ground was steeply banked with ash to create a massive capacity. Millfield was packed for an Amateur Cup tie against Walton & Hersham in 1952 when the official record gate of 17,500 was set. Contemporary press reports put the real crowd as being in excess of 20,000 as entrance gates were barged down. In the late 1940’s and fifties the ground never saw a match with a crowd of less than 4,000, remarkable for such a small town with a population then of 12,000! 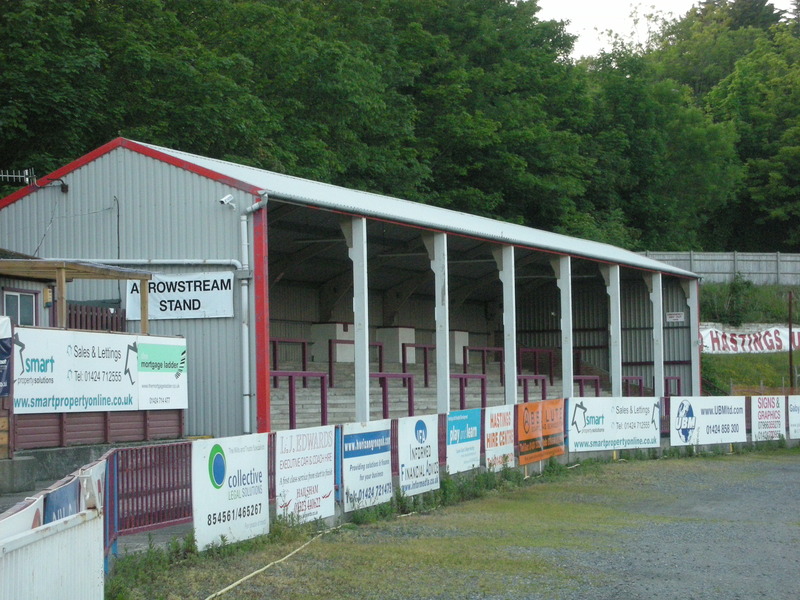 The stand was joined on the same side in 1960 by a large section of covered terrace. 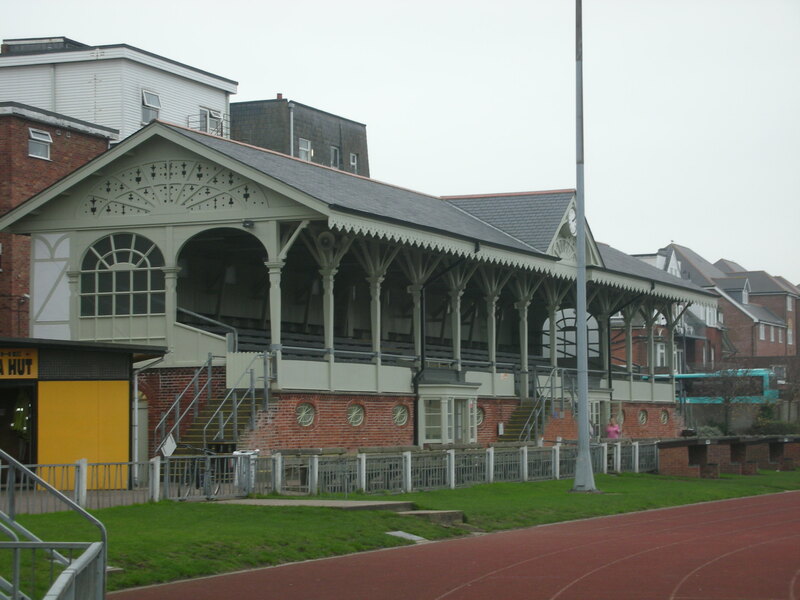 The old grandstand, however, was condemned in 1989 but sympathetic renovation has seen it restored to its former glory. Although the crowds are long gone, Millfield remains a classic venue, albeit one under constant threat of redevelopment or relocation. This classic ground has been home to Northfleet United and the latterly merged Gravesend & Northfleet club since 1905, and is leased from the cement manufacturers, Blue Circle. 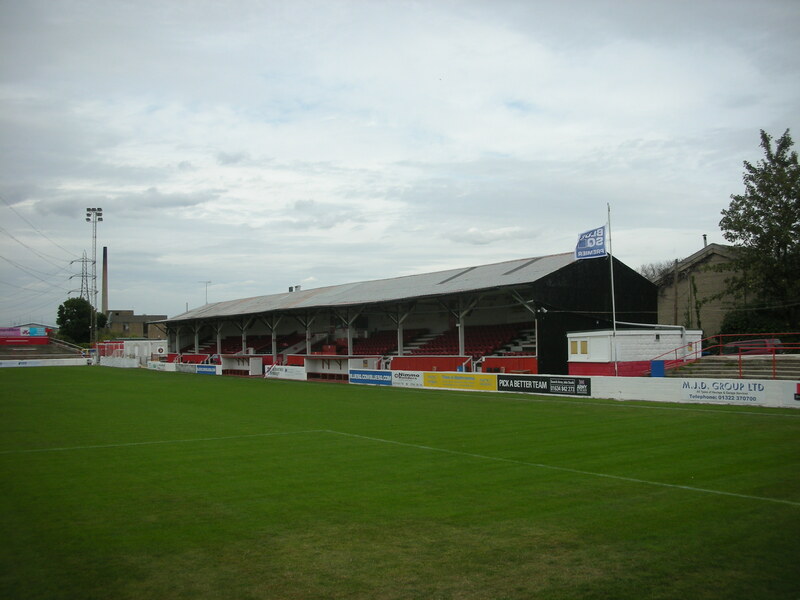 The vast main stand was erected in 1914 and complemented a smaller stand on the Stonebridge Road side of the ground erected some six years later. 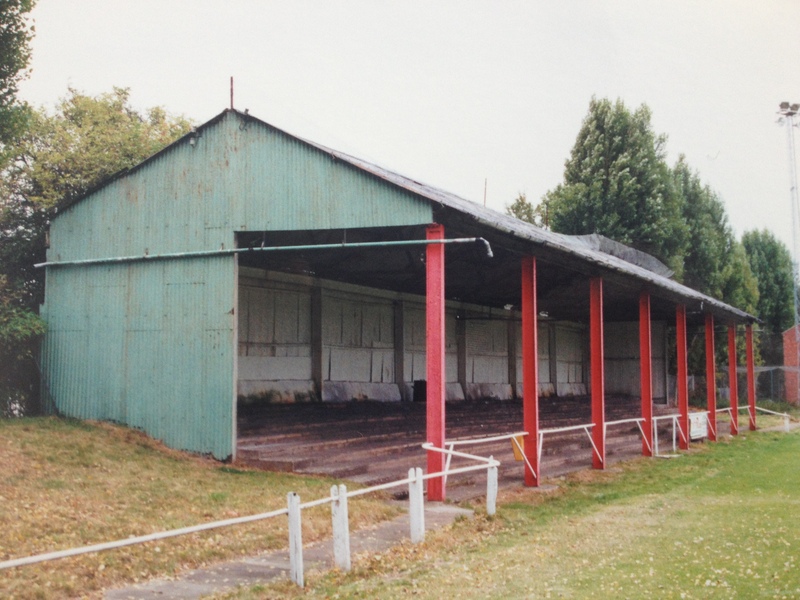 The smaller stand was later demolished and replaced by the present large covered terrace in 1959 which matched the then seven year old cover behind the East goal. In 1980 the Swanscombe End was reterraced to modern safety standards. 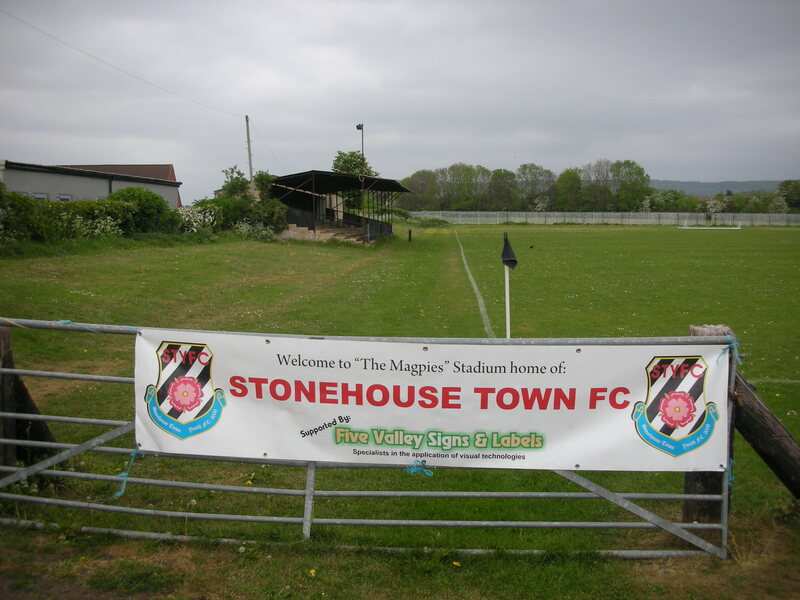 All the developments at the ground over the years, including the installation additional seating, have been sympathetic and in keeping with the site’s great age, but have been done in such a manner that Stonebridge Road remains well up to modern ground-grading criteria. For that the club’s management should take a well deserved bow. Update: the covered terrace on the Stonebridge Road side of the ground was replaced with a modern seated stand which by summer 2017 had still not been finished as the contractor has gone bust. Several incarnations of Esh Winning have been in existence since the village’s first club, Esh Winning Rangers were formed in 1889. Many of the clubs played at the Stag Hill Recreation Ground but all subsequently disbanded until a Sunday side were formed in 1967 under the curious title of Esh Winning Pineapple. 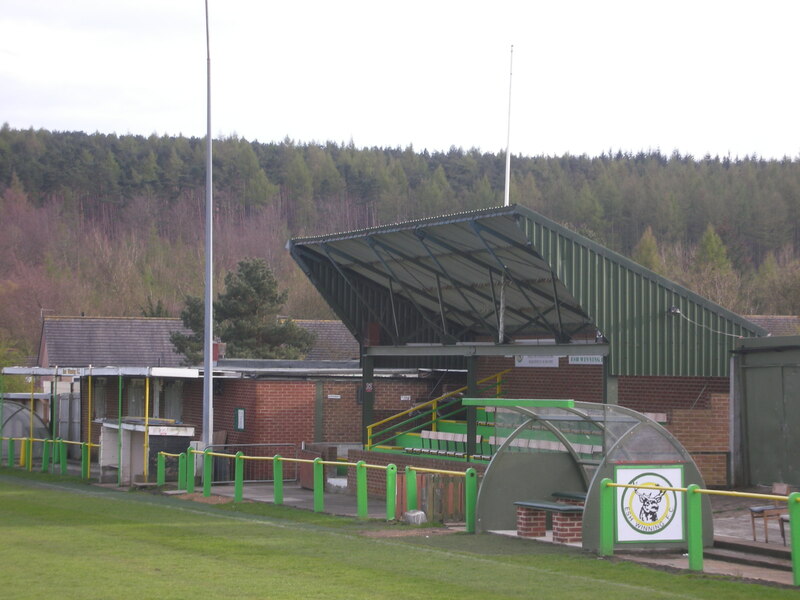 The club secured the use of the Welfare Ground of the disbanded Waterhouses Colliery, eventually purchasing the venue. They only converted to Saturday football, losing their interesting suffix in the process, as recently as 1980 by which time the ground had been developed to the first class venue it is now. Originally the ground had twin stands with the unusual lofted roof spans, lucky one still soldiers on. The ground’s location in the beautiful Deerness Valley makes this a truly evocative and peaceful venue. 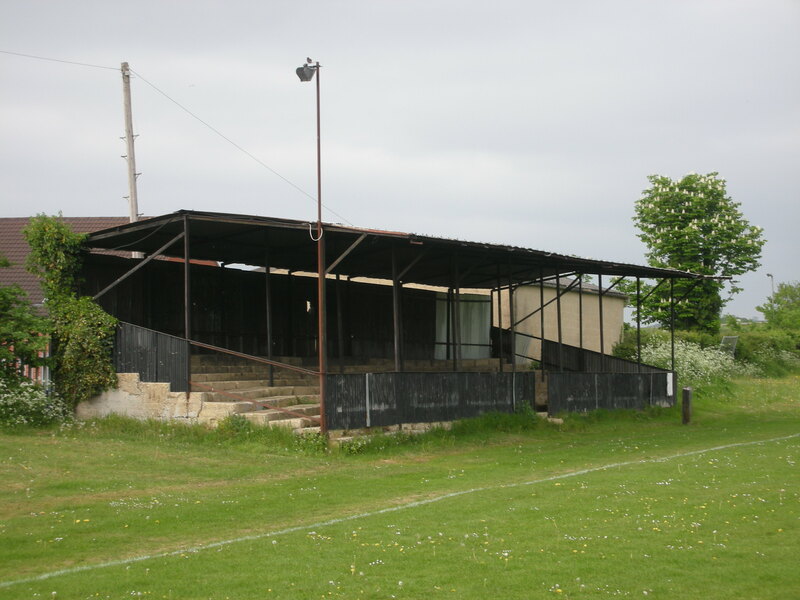 Without doubt the 120 year old grandstand at the Wellesey is the single most photographed ground in non-league history. It is understandable as everything about its construction is aesthetically pleasing. From the dog-tooth fascia board, turned roof supports, roof gable and pierced roof ends down to ornate dressing room window frames it is just a joy. The opposite side of the ground has a not unattractive run of covered benching. 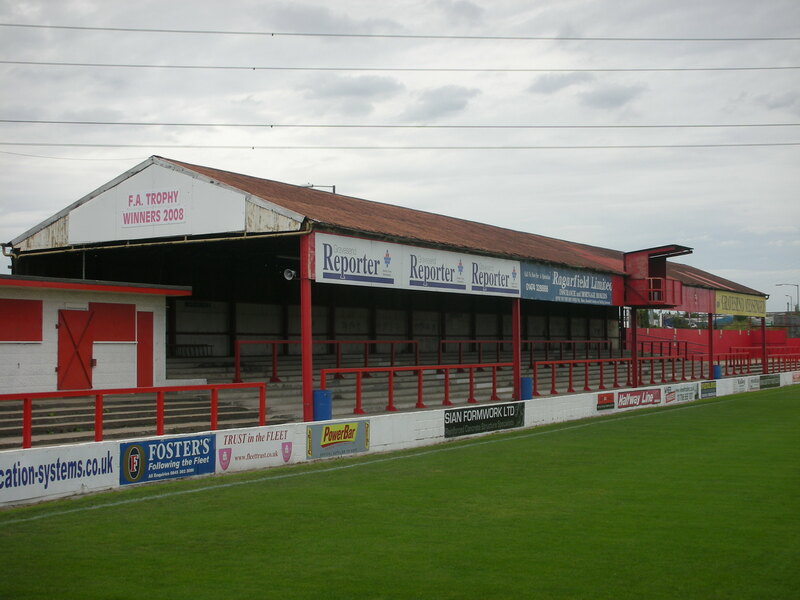 However it is the 1,000 seater stand, built in the summer of 1892, that is the ground’s pride and joy. It even manages to avert the eye from the ghastly all-weather athletics track that replaced a cinder track in the early 1990’s. It was also during that time that the stand was closed for patronage under the Safety of Sports Ground Act due to the presence of large amounts of inflammable timber. However, the preservation order on the stand assures its survival for many future generations to enjoy. 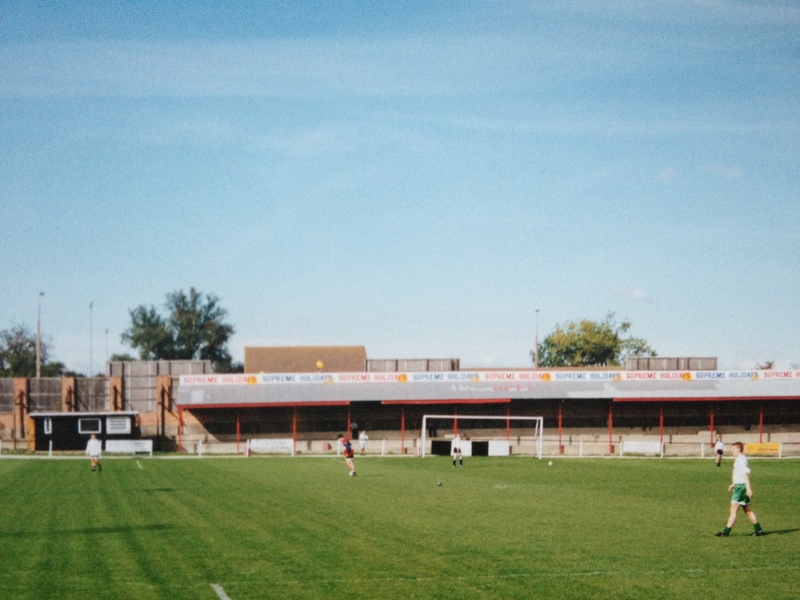 One of the most historic of Essex grounds, The Royal Oak ground opened for business in 1898. It was a good financial move for The Shrimpers as their ground at the Phoenix Field was so close to the North Sea that the club went through a considerable amount of footballs during the course of a season! The ground has suffered the loss of a superb covered terrace, opposite the main stand, in 1979 and 16 years later the open terrace at the south end was deemed unsafe and was demolished. The removal of the terrace has left the dressing rooms stranded on there own someway distant from the rest of the ground. 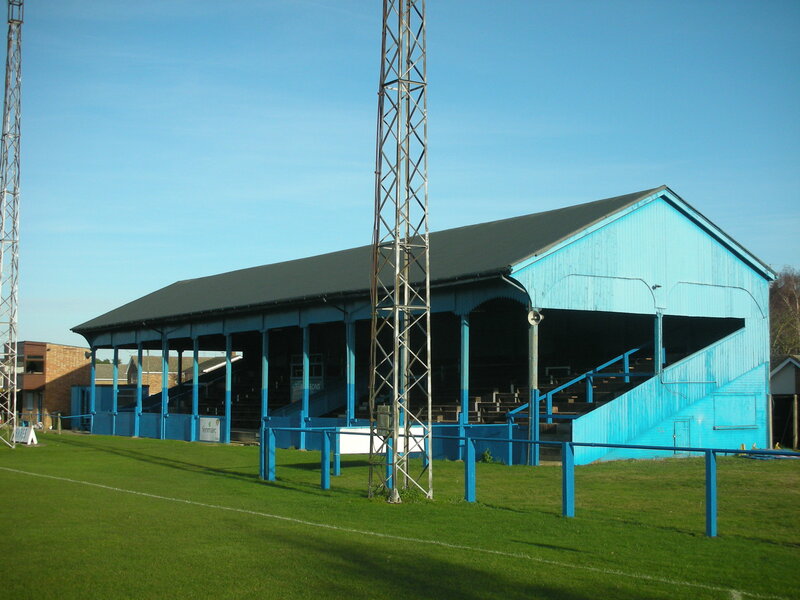 However, the ground retains its famous main stand, erected in November 1948. Its fame, or perhaps infamy, stems from the unusually sharp sightlines caused by the angle of construction of the stand. Visitors of vertiginous disposition may need to view the game from ground level. 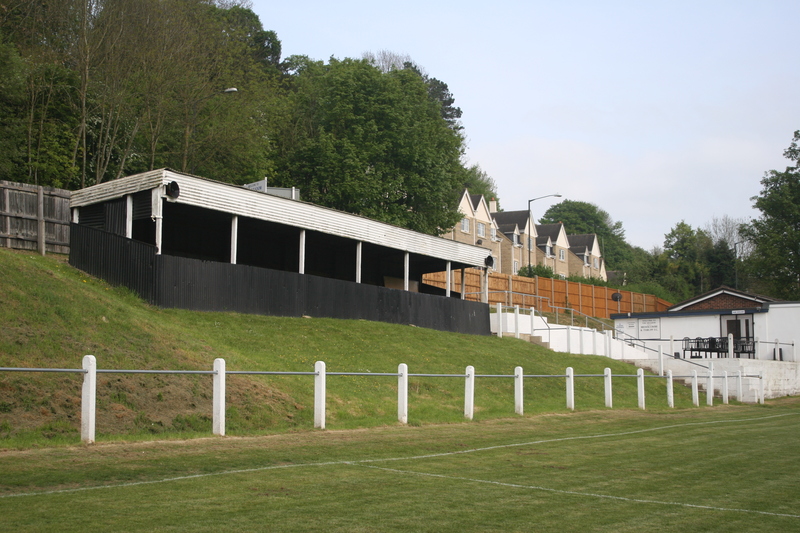 The current ground is completed by the covered terrace at the Main Road end which features quite possibly the deepest steps of terracing in the country. One time FA Amateur Cup Finalists, the club has fought valiantly with severe financial woes and now finds itself in the somewhat reduced circumstances of the Essex and Suffolk Border League. In short the Royal Oak is an essential and quirky visit. The most recent of many threats to this dear old ground comes with the local council wishing to sell the adjacent car park for new housing. The Pilot Field and “the upper ground” known as The Firs, formerly the home of St.Leonards and Stamco, have had a quite remarkable and at times torrid history. Hastings Town were formed in 1894 and had three separate spells playing at the top pitch. 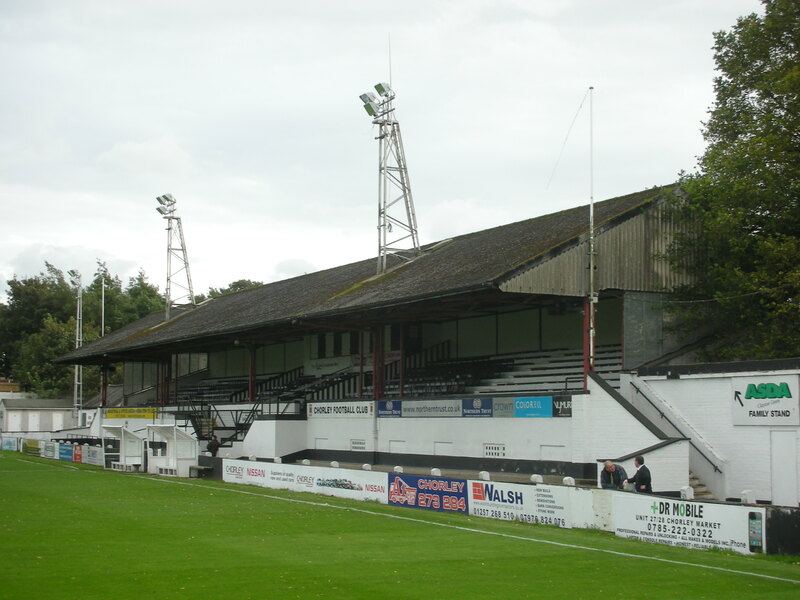 However, the club played at The Pilot Field between 1923 and 1948. The council had opened both grounds in 1921 at a cost of £32,000. In 1923 the present vast main stand at the Pilot Field was opened at an additional cost of £8,000. In 1948 a professional club, Hastings United, were formed and Town returned to the smaller ground at The Firs. Speedway had come to the Pilot Field in 1948 and some of the old track still remains today. However after one season racing was banned by the council after complaints of noise from neighbours. The 1950’s saw some huge crowds at the Pilot Field, the largest being 12,727 for the visit in an FA Cup tie of Norwich City in January 1954. However by 1985 Hastings United had folded following bankruptcy. 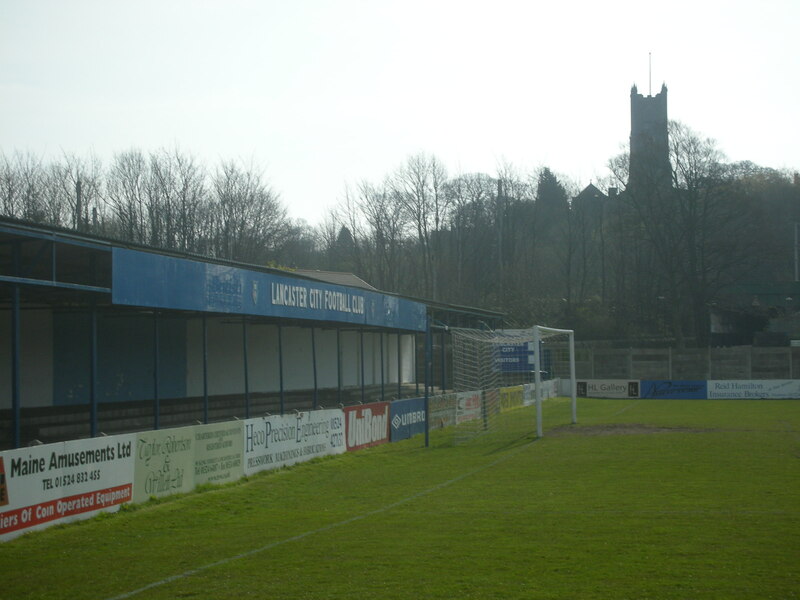 Town seized the opportunity to return to the Pilot Field and took United’s place in the Southern League. 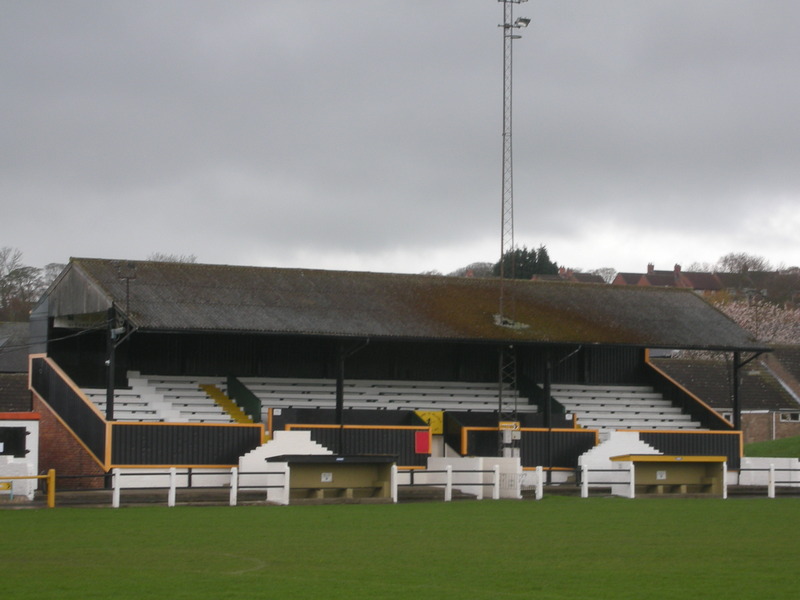 The club remain in this vast venue despite modest support, and to complicate the story still further Hastings Town opted to change its name during the summer of 2002 to… Hastings United! The long trek for a visitor to this remote part of North Norfolk will be rewarded with a truly classic venue. The Walks has been home to the club since its formation in 1879 as Lynn Town. 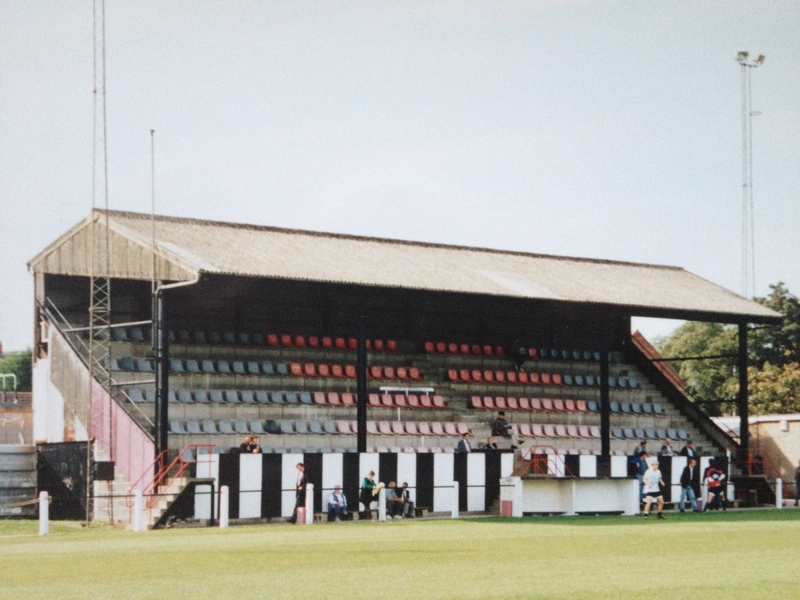 The vast main stand was built in 1956 and replaced an older wooden stand. As well as seating 1,200 people, the stand also houses the clubhouse, dressing rooms and club offices. 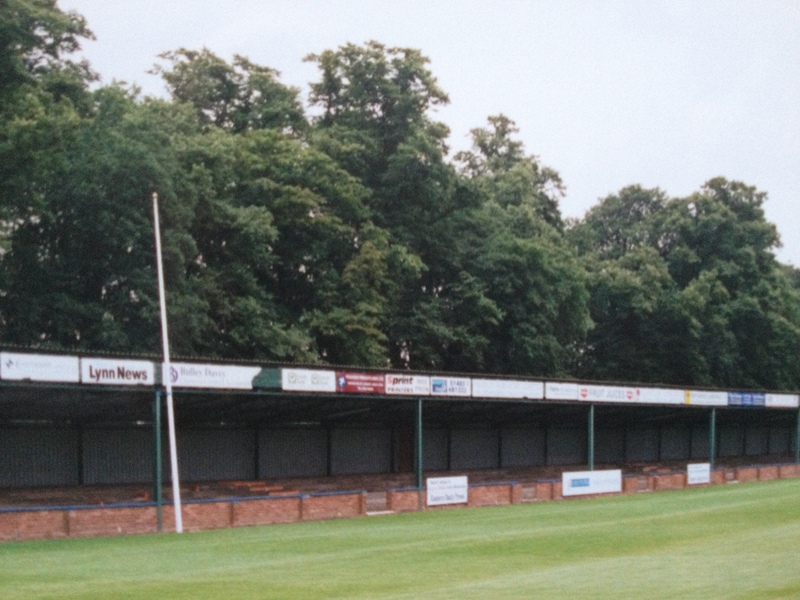 Opposite the main stand is a long covered terrace, although originally this had additional seating. The seats were disposed with in 1968, but still live on at Hereford United’s Edgar Street ground. The rest of the ground has ample terracing. The club’s heyday was undoubtedly the 1950’s and 60’s when large crowds thronged to The Walks, including nearly 13,000 for a 1951 FA Cup tie with Exeter. Between 1956 and 1962 the club made seven successive, but ultimately unsuccessful, applications for Football League membership. Another run in 1962 culminated in a third round tie at Everton where a 45,366 gate secured a share of gate receipts of £4,341, which cleared all debts and paid up mortgages for houses owned by the club. 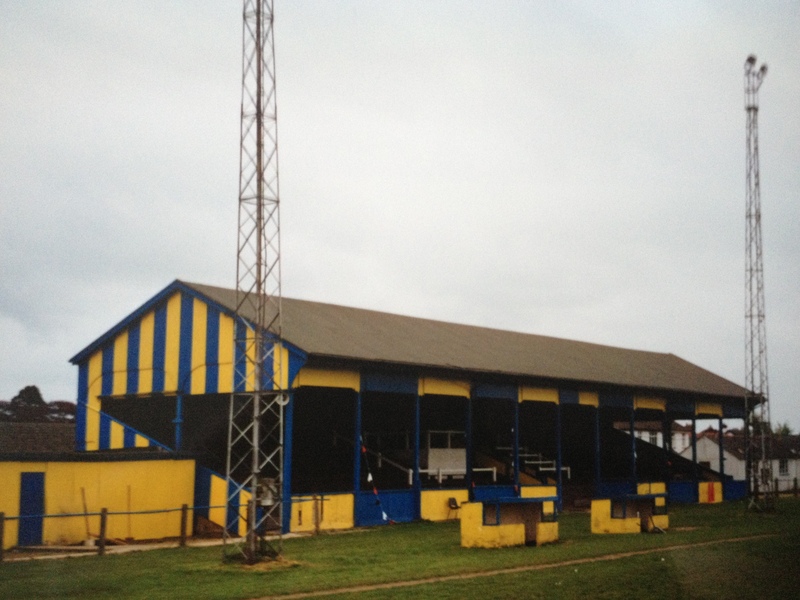 The old Kings Lynn club collapsed financially in 2009 and reformed as Kings Lynn Town. Even by today’s stringent safety guidelines, The Walks has a capacity of 8,200 and with Kings Lynn having a potential catchment area of 150,000 people, you can’t help but think that the club really should have achieved so much more. 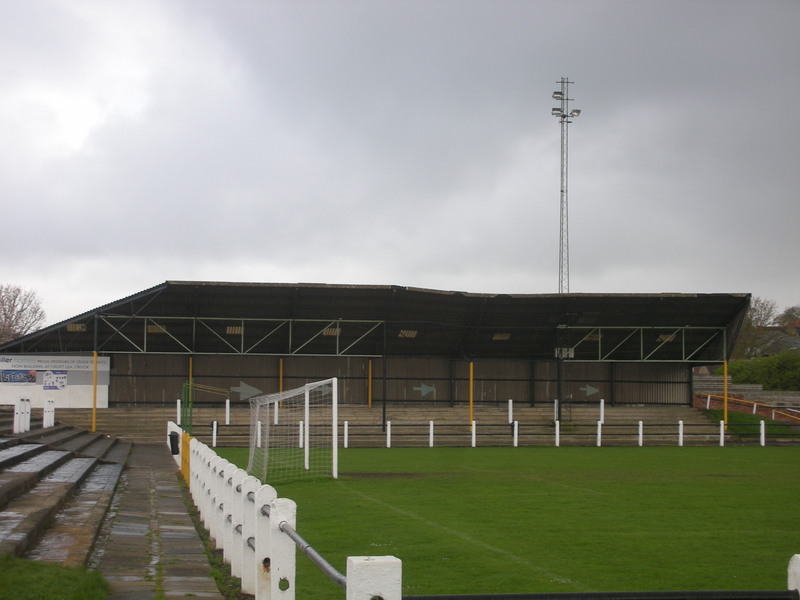 The then Lancaster Town’s first two games were at a field adjacent to the current ground which was known as Quay Meadow. Since then home has always been the unusually named Giant Axe Ground. Now 100 years old, The Giant Axe has undergone numerous changes over its lifetime, most recently in November 1976 when two wooden grandstands were gutted by fire. The ground now has amazingly fortified retaining walls to try and put off would be vandals. The old clubhouse was also left as charred remains after an arson attack. The impressive main stand was built on the site of the burnt out stands. There is also ample covered accommodation, all of recent vintage, to give The Giant Axe a thoroughly modern outlook. The oldest remaining part of the ground is the wooden pavilion that serves as the changing rooms, just about the only part of the ground that has survived the attention of the local delinquents. The obvious focal point of the GER sports ground is the superb wooden main stand. Originally striped in club colours of yellow and blue, with an intensity of palette straight out of a gaudy modernist painting, nowadays a wash of plain blue suffices. 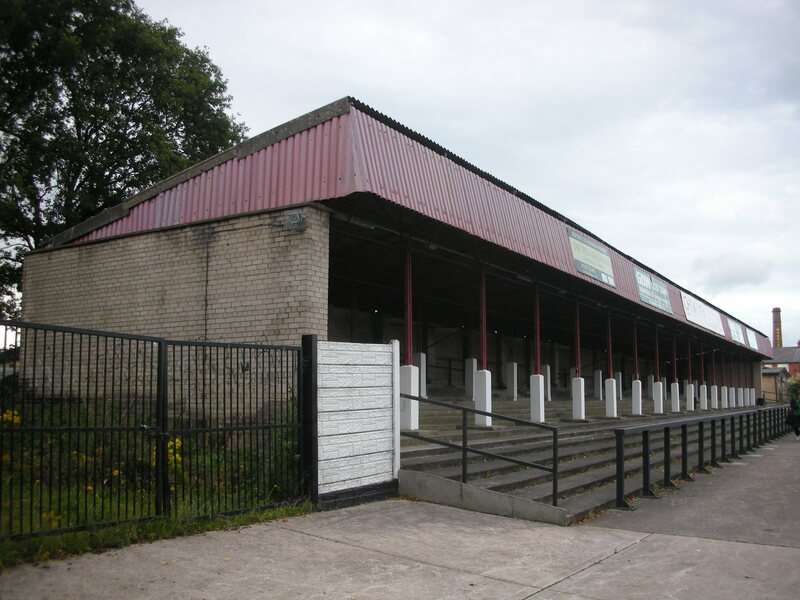 The ground was originally opened in 1925 when it was home to GER United. However, this club did not reappear after the shutdown of football during World War II and March Town, who had lead a nomadic life before the hostilities, took over the venue. The ground was originally called Shepperson’s Field and was owned by the March Grammar School before GER bought the site. Although the pitched roof wooden stand is certainly impressive to look at, the view from within is hampered by the presence of no less than twelve roof supporting struts, a floodlight pylon and the modern two story administration block that obstructs the view of the goal areas for many of the seats. On the opposite side is a covered terrace erected in 1950. 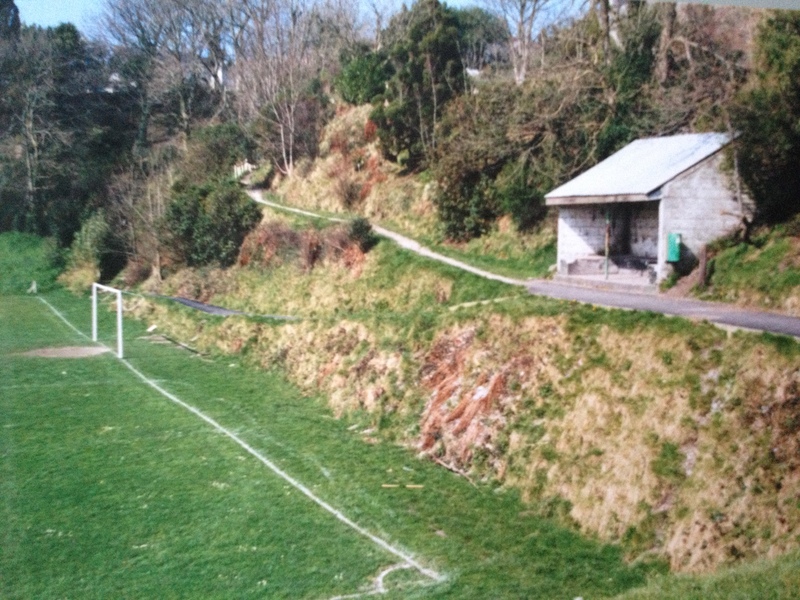 There was originally a greyhound track around the pitch but this has long been grassed over and the pitch widened slightly to bring the action nearer to the stands. A truly diverse sporting venue, the ground has played host to a large number of sports over the years including cricket until 1960. 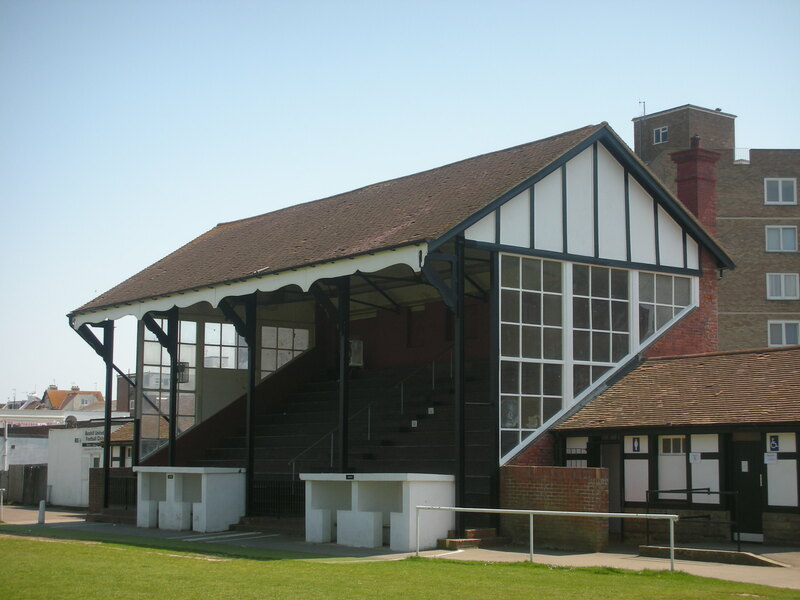 The Alfred Davis Memorial ground has been home to Marlow since 1924. 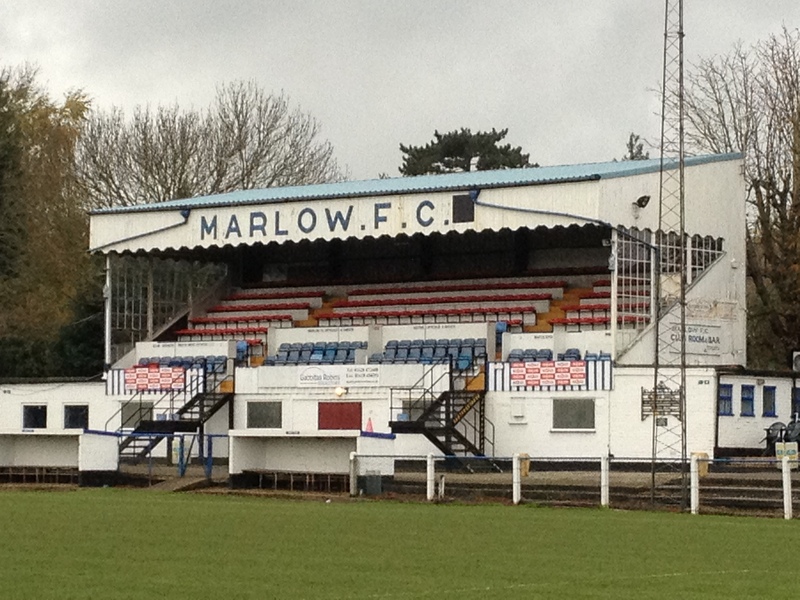 Marlow were formed in 1870 and were one of the 15 clubs in the very first FA Cup competition. The clubs ground at Crown Meadow had been sold during World War I and after five years at the basic and unsatisfactory Star Meadow, the club secured the use of a field just off Oak tree Road. The finances had been organised by club secretary Alfred Davis who sadly passed away before the ground was opened. Fittingly the committee named the new venue in his memory. The wonderful main stand was built in 1930 and looks as good now as it has ever done. Lovingly kept and with only the slightly unsightly addition of steel fire escapes in recent years, the stand is a masterpiece of construction. 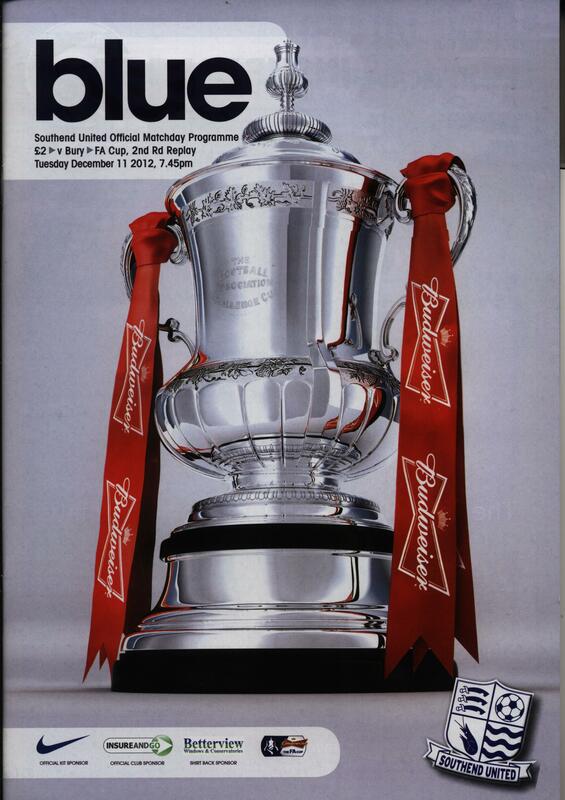 The cover opposite was opened in 1950 and was joined behind the goal by one of a modern design in 1992. The top goal has a shallow open terrace behind which is an all weather surface opened in 1991. The club has gained an extra source of revenue by turning over one corner of the ground to a small electricity generator. The retro feel of the ground is augmented by the presence of 1970’s R.Whites Lemonade steel rubbish bins dotted around pitch side. However, the ground remains picturesque and a more than fitting tribute to Alfred Davis. 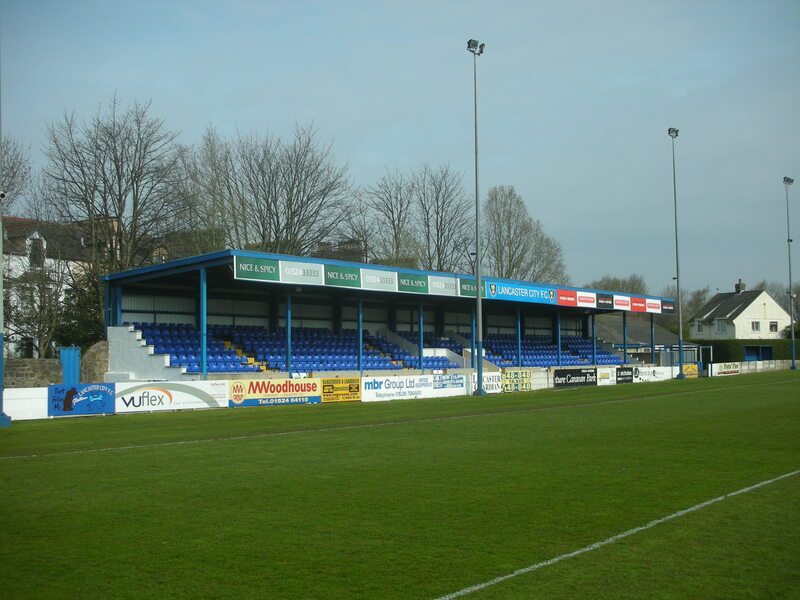 Another ground that has now well passed its’ centenary having been home to Matlock Town since 1895. 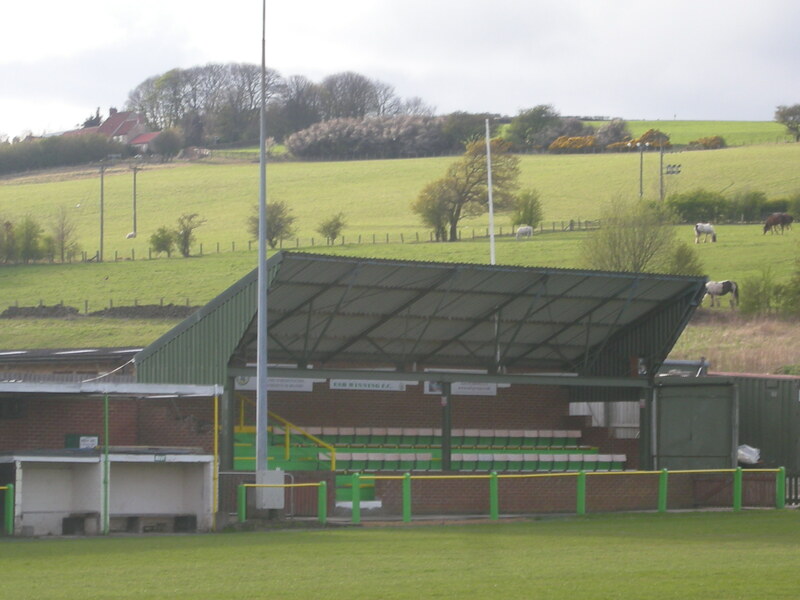 The Causeway Lane ground is set in one of the most picturesque towns in the Peak District. It has a splendid setting with panoramic views of the Matlock Dales with RiberCastle perched on high overlooking the ground. The ground had a ramshackle wooden stand which had been erected in 1920 but had sadly reached the end of its serviceable life. A £300,000 redevelopment programme has seen a new modern stand taking its place, with provision for 500 seats. Refreshingly it was built with considerable assistance from local steel specialist Twiggs. The Causeway Lane side has a simple wooden cover. Without a doubt the new stand has bought the ground kicking and screaming into the 21st Century. Victoria Bottoms, Fore Street, Nanpean, Cornwall. Victoria Park has gained cult status amongst ground aficionados over the last two decades. It was carved out of a clay quarry in 1936 and the resulting banking has created a unique footballing venue. The banks are covered in grass, trees and bushes and are criss-crossed by numerous pathways. Behind both goals are white shelters, useful in inclement weather, but the regular followers of The Rovers could choose a different vantage point for every home game during a season and would still have plenty more to try out! The attractive pavilion also doubles as a memorial to lads from the village killed in World War II. Victoria Park is a football watcher’s paradise, plenty to look at around the ground if the on pitch action is not too great! Another of Cornwall’s many glorious grounds, and another like Falmouth and Bodmin that looks older than it really is. What makes Penlee Park special is the fact that it was built solely from volunteer labour. Many tonnes of soil were moved by hand as the pitch was levelled and drainage laid. Due to appalling weather, the workers would often return to find their previous day’s toils washed away by torrential rain. The ground finally opened in time for the 1952/53 season and the club enjoyed their halcyon days at their new home. However in recent years the club fell on hard times and Penlee fell into a state of considerable disrepair not helped by the unwanted attention of local vandals. 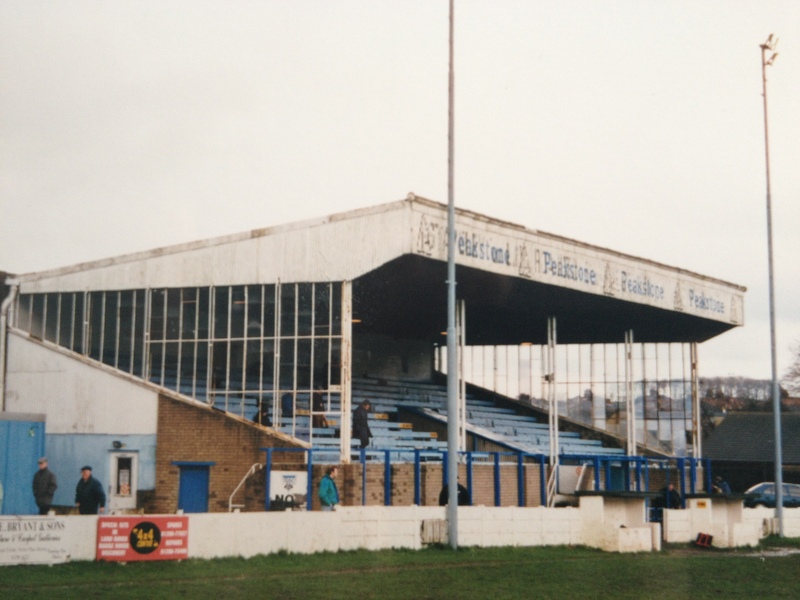 In the late 1990’s the club undertook extensive repairs, fencing was reinstated, and the stand and the ground’s ornate entrance were restored to their former glory. 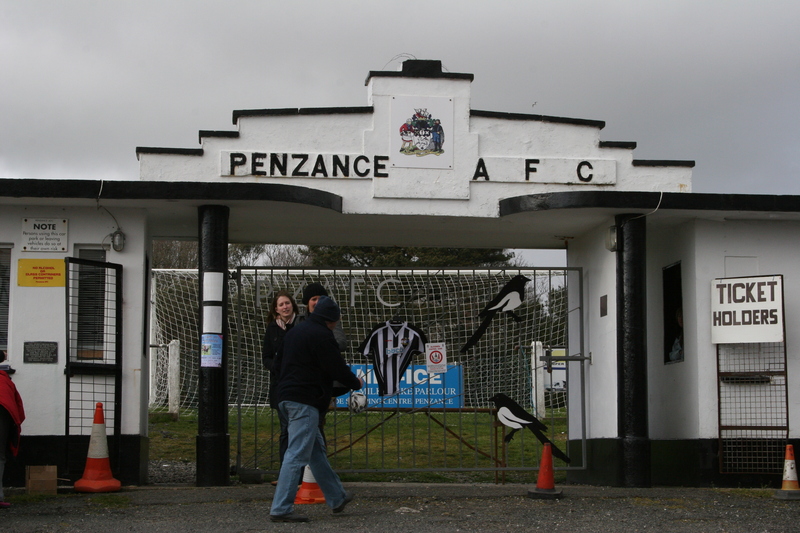 The original builders, some of whom still attend matches, would have been proud as Penlee Park is once again a beautiful venue and a suitable monument to their endeavour. Of the many wondrous grounds in Gloucestershire, Oldends Lane remains my personal favourite, it positively reeks of atmosphere and cries out for a large crowd to gather. A large crowd did gather in September 1951 when 5,500 packed in to Oldends Lane, then two years old, when the FA Cup brought GloucesterCity to Stonehouse. The ground is essentially the same now, except for a few coats of paint, as it was when it was opened by Wolves and England captain Billy Wright in August 1949. The ground has a magnificent seated stand on one side and a large covered stand on top of a grass bank at the car park end of the ground. The club enjoyed some heady days in the Somerset Senior League, but fell into decline due to loss of revenue incurred when the clubhouse was sold off. Encouragingly the club has reinstated the covered stand behind the goal and undertaken considerable work around the ground. The days of four figure crowds are long gone but to me it is a splendid reminder of how village football used to be. Now well past its 120th year the War Memorial Ground is most unusual, but has suffered from the loss in 1990 of the old High Street end wooden stand during its centenary year. At the opposite end of the ground is a large cavernous covered terrace which has stood since before World War II. 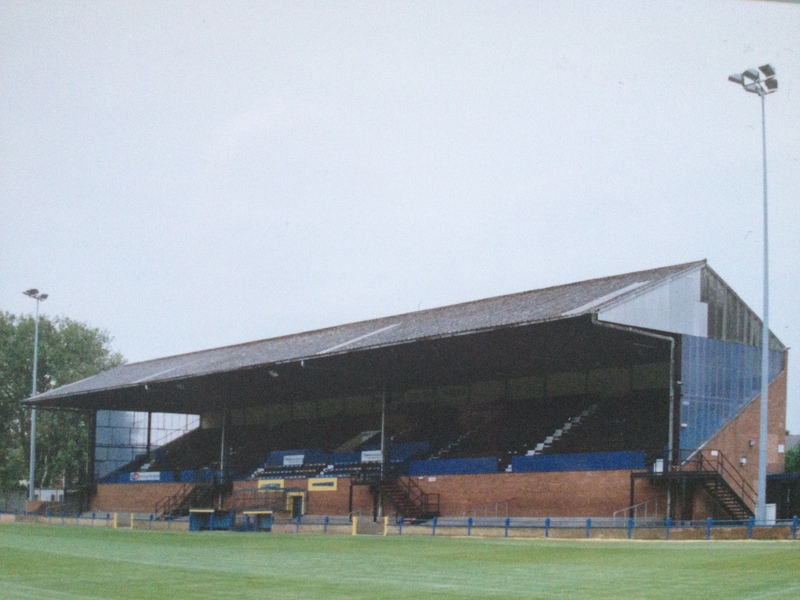 At the same time the unusually roofed seated main stand was also built, but was joined after the war by its less aesthetically pleasing wing extensions. 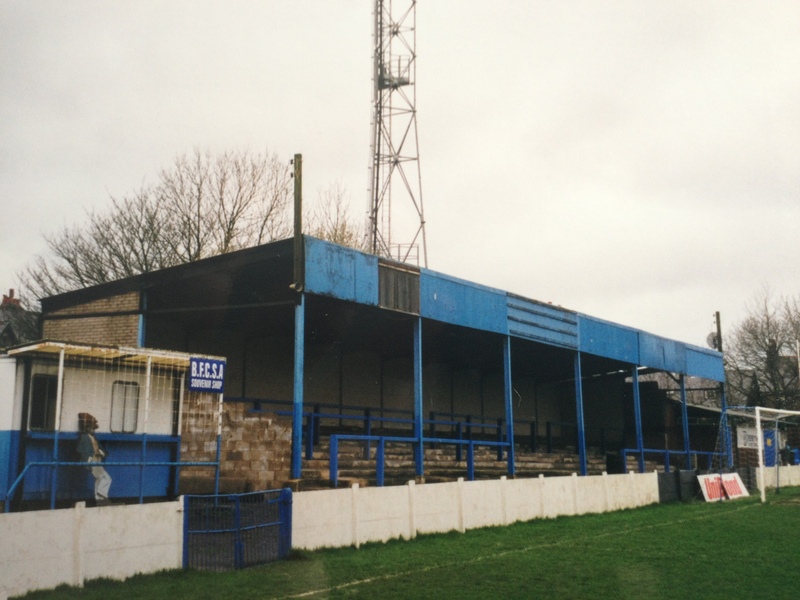 The most recent developments at the ground came in the sixties when floodlights, as well as a new clubhouse and changing rooms, were provided. Several plans of relocation, including one to the old Brierley Hill Town ground, have luckily come to nought and this ancient venue struggles manfully onwards. 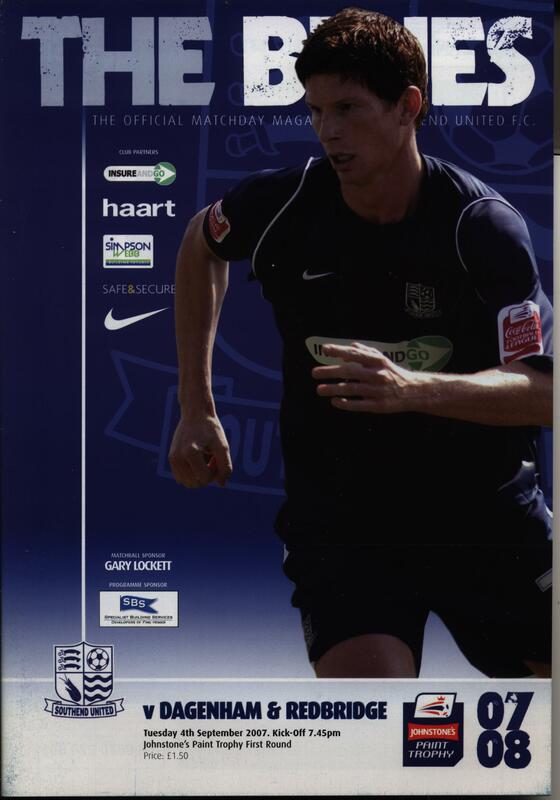 Southend United’s dramatic penalty shoot out win against Oxford United in the semi-final of the Johnstone’s Paint Trophy was the club’s eighth shoot out in cup competitions over the years. The 5-3 win on spot kicks at the Kassam Stadium means the club has now won four and lost four in the dreaded shoot outs. Team: Paul Smith, Sean Clohessy, Chris Barker, Mark Phillips, Ryan Cresswell, Kevan Hurst, Alex Woodyard, Michael Timlin, Anthony Straker, Barry Corr and Gavin Tomlin. Subs: Daniel Bentley (for Smith); Elliot Benyon (for Corr), Luke Prosser (for Woodyard), David Martin and Ryan Leonard. Sturrock dramatically substituted Paul Smith in injury time for Daniel Bentley following the youngster heroics in the shoot out with Bury in the FA Cup. 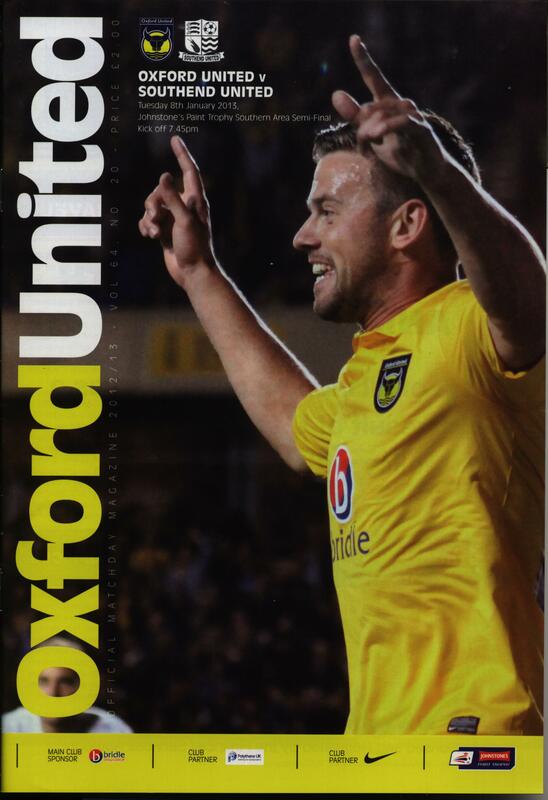 Tomlin, Clohessy, Hurst and Timlin all scored for Southend as did Rigg, Craddock and Davis for Oxford. Bentley then saved Oxford’s fourth penalty from Alfie Potter, allowing Elliot Benyon to score the decisive spot kick. Team: Daniel Bentley, Sean Clohessy, Chris Barker, Luke Prosser, Ryan Cresswell, Kevan Hurst, Marc Laird, Michael Timlin, David Martin, Barry Corr and Gavin Tomlin. Subs: Freddy Eastwood (for Martin), Elliot Benyon (for Corr), Alex Woodyard, Graham Coughlan, John Spicer, Alex Woodyard and Ted Smith. Schumacher and Doherty scored Bury’s first two before Worrall, Hewitt and Hughes all missed for the visitors, Hewitt blazing wide while Bentley saved from Worrall and Hughes. 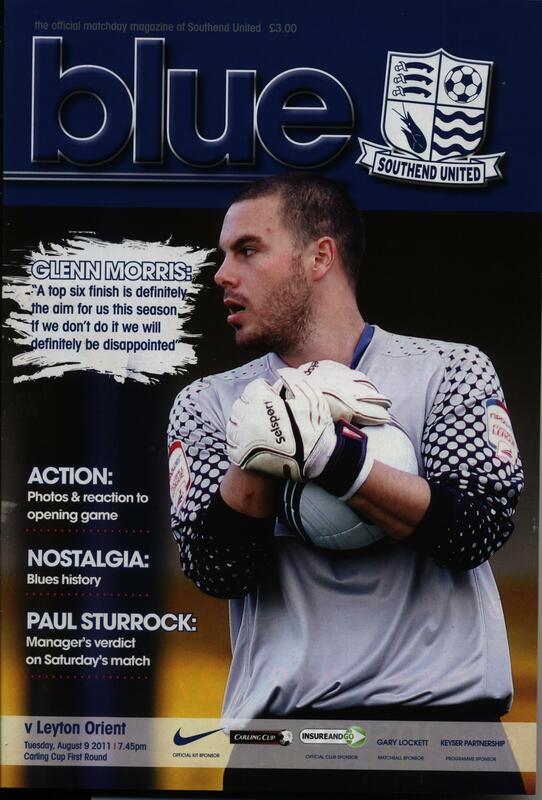 Eastwood, Clohessy and Hurst all scored for Southend while Gavin Tomlin’s chipped penalty, saved by Trevor Carson proved to be academic. Team: Glenn Morris, Sean Clohessy, Luke Prosser, Mark Phillips, Graham Coughlan, Ryan Hall, JP Kalala, Kane Ferdinand, Jemal Johnson, Liam Dickinson and Neil Harris. Subs: Anthony Grant (for Ferdinand); Lee Sawyer (for Johnson); Bilel Mohsni (for Phillips); Harry Crawford; Peter Gilbert; Allasane N’Diaye and Daniel Bentley. Team: Glenn Morris, Sean Clohessy, Peter Gilbert, Bilel Mohsni, Luke Prosser, Josh Simpson, Anthony Grant, Craig Easton, Sofiene Zaaboub, Jack Midson and Barry Corr. Subs: Antonio German (for Prosser); Blair Sturrock (for Midson); Ryan Hall (for Zaaboub); Louis Soares; Graham Coughlan; Lyle Della Verde and Rhys Evans. 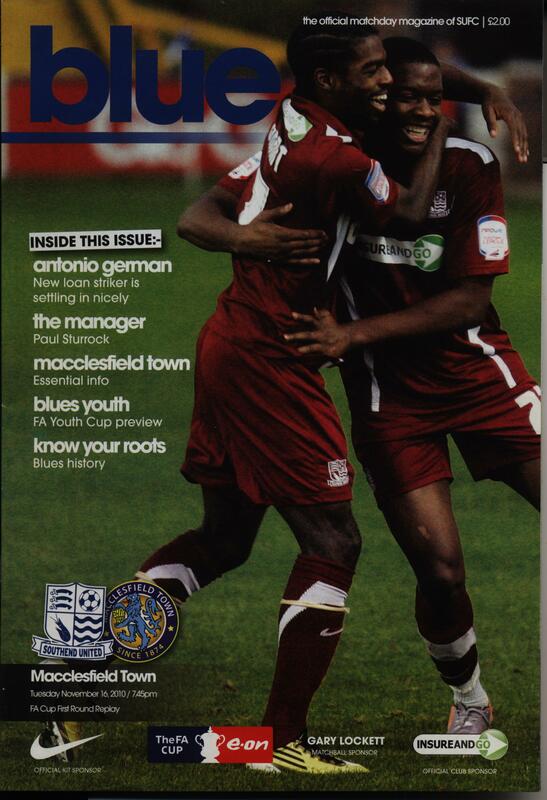 Chalmers, Barnett, Bencheriff, Reid, Brown all scored their penalties for Macclesfield. German netted our first, Corr blazed over, then Clohessy and Hall both scored their spot kicks. Team: Rhys Evans, Josh Simpson, Peter Gilbert, Chris Barker, Bilel Mohsni, Adam Bouzid, Anthony Grant, Craig Easton, Ryan Hall, Blair Sturrock and Barry Corr. Subs: Louis Soares (for Bouzid); Sofiene Zaaboub (for Hall); Matt Paterson (for Corr), Graham Coughlin and Glenn Morris. 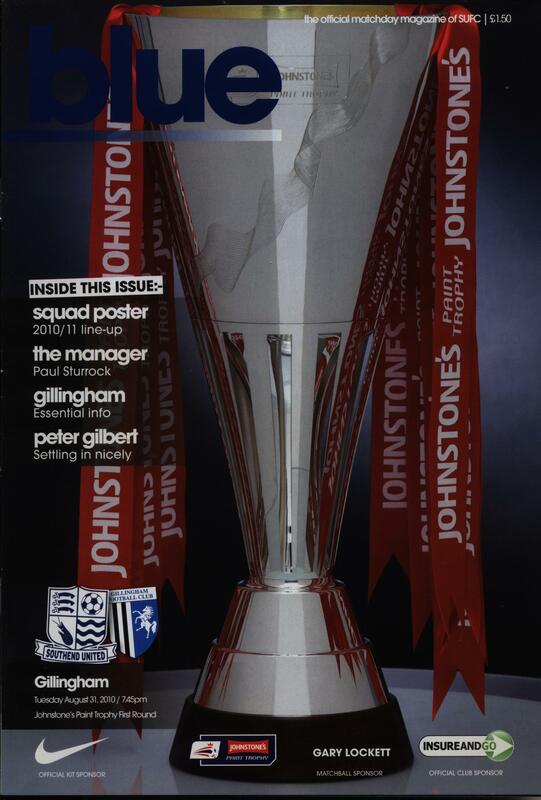 Gillingham: S. Payne (saved); McCammon, Nutter, Maher (all scored), Spiller (over), J.Payne (saved). Team: Steve Collis, Lewis Hunt, Adam Barrett, Peter Clarke, Garry Richards, Ritchie Foran, Nicky Bailey, Alan McCormack, Tommy Black, Matt Harrold and Eric Odiahambo. Subs: Gary Hooper (for Odiahambo); Charlie McDonald (f0r Harrold); Franck Moussa; Simon Francis and Daryl Flahavan. Southend: Foran, Bailey, Hooper, MacDonald, McCormack (missed), Clarke, Black & Hunt (saved). Team: Daryl Flahavan, Duncan Jupp, Che Wilson, Andy Edwards, Adam Barrett, Mark Gower, Mark Bentley, Kevin Maher, Carl Pettefer, Tes Bramble and Wayne Gray. Subs: Drewe Broughton (for Bramble); Lewis Hunt (for Jupp); Jim Corbett (for Gower); Michael Kightly and Nicky Nicolau. 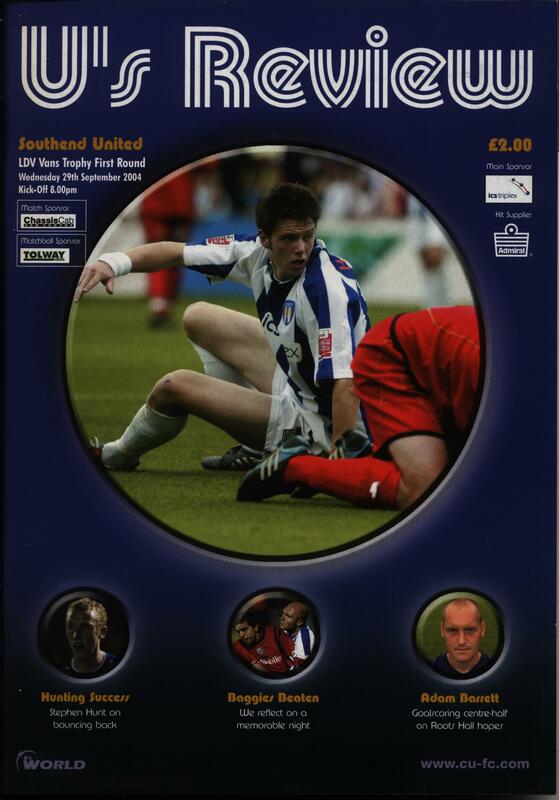 Gray, Hunt, Maher, Broughton and Corbett scored all five penalties for Southend. Team: Paul Sansome, Garry Poole, Chris Powell, Phil Gridelet, Andy Edwards, Graham Bressington, Jonathan Hunt, Derek Payne, Gary Jones, Ricky Otto and Jason Lee. Subs: Tommy Mooney (for Jones), Andy Sussex (for Payne) and Simon Royce. Graham Bressington missing the vital spot kick for Southend. 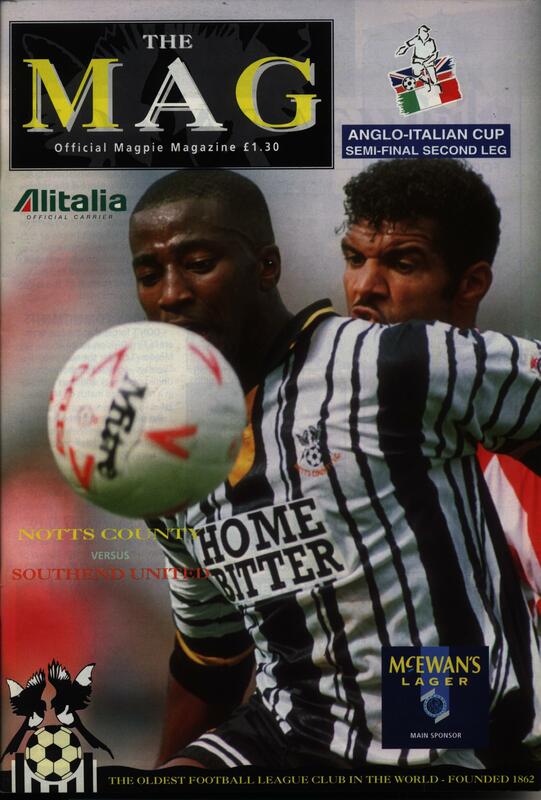 NottsCounty progressed to the Wembley final which they lost to Brescia. The year 2012 will always be remembered by many as the year we marvelled at the prodigiously talented Lionel Messi. It was a year that his seemingly endless catalogue of goals was fastidiously plotted in the hope he could break Germany’s Gerd Müller’s 40 year old record from 1972 of 85 goals in a calendar year. Müller was known as “Der Bomber” and his record in 1972 of 72 goals for Bayern Munich and 13 for West Germany was impressive enough but when Messi scored twice against Real Betis on December 9th he eclipsed that total with his 86th goal of the year. Almost unbelievably Messi scored five more before the end of the year, twice against Cordoba in the Copa del Rey, twice against Atletico Madrid and once against Real Valladolid to take his annual total to an astonishing 91 goals. He not only beat “Der Bomber’s” world record he smashed it! Or did he? Step forward Godfrey Chitalu, a Zambian centre forward of the 1970’s whose records and scoring feats have been picked up for investigation after some relentless pushing from the Zambian Football Federation. However, General Secretary of FIFA, Jerome Valcke, has adopted a defensive stance on the matter claiming FIFA only verified records of competitions under their own jurisdiction. So who was Godfrey Chitalu? He was born in Luanshya, Northern Rhodesia in October 1947 and started his senior playing career with Kitwe United in 1964. He was nicknamed “Ucar” after the supposedly everlasting Ucar car batteries manufactured by Union Carbide. Chitalu was playing for a top professional Zambian side, Kabwe Warriors as well as his country when his goalscoring proficiency reached its impressive zenith. In 1971 he scored a mere 89 goals for club and country but the following year was to prove mindboggling in terms of his proficiency in front of goal. Ironically 1972 was the year Gerd Muller set his accepted record of 85 goals. Analysing Chitalu’s records makes for remarkable reading, he scored eighteen hat-tricks during 1972 and during a run of nine games scored an incredible 25 times. In total during 1972 Godfrey Chitalu scored an astonishing 107 times in just 59 matches. What makes his record even more remarkable is there were eleven games where he failed to score at all meaning the 107 came in 48 scoring appearances! What is even more astounding is reports that the Zambian FA have discovered records that he scored a further nine times over two legs of an African Champions Cup tie against Matjantja although this has not been ratified by the organisers of that competition. Some of Chitalu’s performances are worth recording, for example he scored a double hat-trick against Kalalushi Modern Stars in a 12-3 victory at their home ground of the Railway Stadium. He also loved playing in the Chibuku Cup that season. In Kabwe’s opening game he got a hat-trick against Butuondo Tigers. In the quarter final against Buselio he scored five of Kabwe’s goals in a 10-2 massacre. In the semi-final he scored against Roan United in a tight 3-2 win at the Gabbitas Stadium. In the final staged at the Dag Hammarskjoeld Stadium, Chitalu shone once again scoring four for the Warriors in a 5-3 triumph over Rhokana United. In the Zambian Challenge Cup Final he scored two more in the 3-1 defeat of Ndola United. He also scored for the Zambia National XI against a touring Sheffield United in a 1-1 draw at the Independence Stadium. Some of his goals could be questioned as to whether they were first class matches, two came in an “exhibition match” for an All Stars XI against The Rest at the Buchi Stadium and three more came in two representative matches for the “Midlands XI” against the “Copperbelt XI”, but was is undoubted is they he did scored this vast quantity of goals in 1972 mainly in four competitions the Zambian Premier League, the Zambian Chibuku Cup, the Zambian Challenge Cup and the African Champions Cup. What does seem strange however is that it has taken Lionel Messi’s fantastic scoring feats for club and country for the case of Godfrey Chitalu to come to the world’s attention. Sadly no one will ever be able to verify all this with the man himself, Godfrey Chitalu was the manager of the Zambian national team when their plane crashed over Gabon in 1993, killing 30 people including Chitalu, who was only 45.